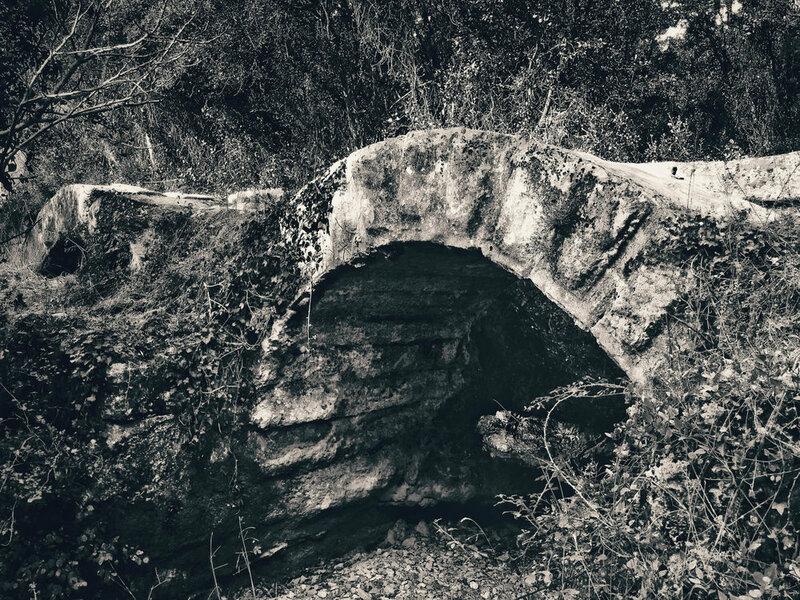 Having had a long-time interest in Roman aqueducts, and having recently moved to this part of the world, Charles Southgate has begun the task of recording for himself the location of all visible vestiges of the Roman aqueduct that runs from Uzès to Nîmes and crosses the Gardon via the Pont du Gard. My ambition is to follow his progress photographically, revealing some of the atmosphere of these sights. Unesco World Heritage site, well know, well protected, magnificent in its ambition as well as its execution, a thing of architectural and artistic beauty and longevity - but in essence only a 274m means to an end in a 50km aqueduct carrying water from Uzès to Nîmes. They had to cross the Gardon somehow! But what of the other 49.726km, stretching from the Fontaine de L'Eure in Uzès to the Castellum in Nîmes, using the barest of vertical drops of only 14m in total over that distance? Under the distant tree is Charles at work. Eventually his ambition is to have mapped the entire line of the aqueduct using GPS waypoints to link these vestiges and his discoveries along the way. This is no easy task: while there are some very visible parts, well visited, others even though recorded are overgrown, yet others are unrecorded, and the descriptive and photographic record is at times quite incomplete or old and not recently mapped. They are evocative in a way their better-known sibling is not, firing the imagination both with the sheer scale of the project and the incredible feat of engineering that in places required the aqueduct to maintain downhill progress of millimetres every hundred metres. And it is NOT a straight line! Over bridges, under tunnels, following contours, each metre required precise engineering and often novel solutions to maintaining the gradient. 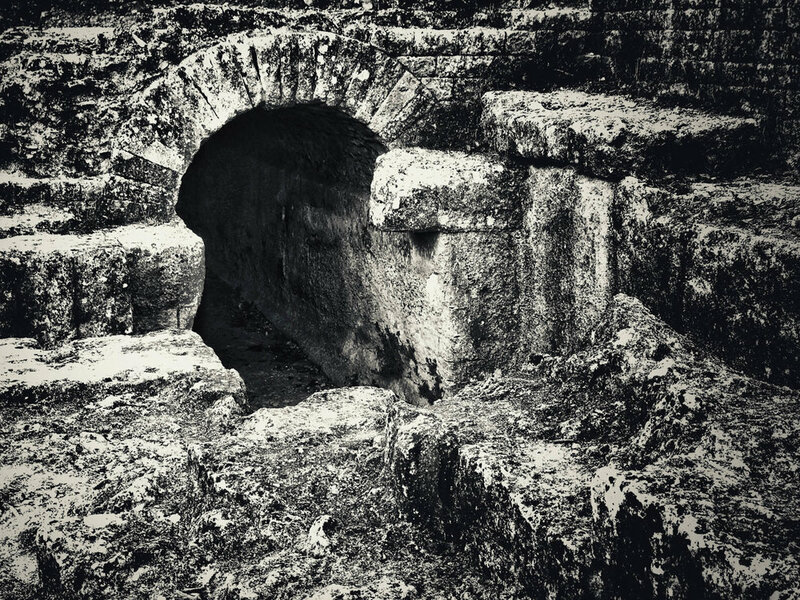 The first phase of the project is to travel the length of the aqueduct, from source to the distribution point in Nîmes, the Castellum, recording significant and interesting fragments as they appear along the way. Follow progress in 'This month', with periodic updates. Go to the Nemausus Project page in this website for the complete set as they appear. The regulation basin, located near the source, used sluice gates to control the flow of water into the aqueduct and return excess to the Alzon River. From here, over the next 3 kilometres, there are extensive visible vestiges of the channel as it winds south before tracking east towards the Gardon and the Pont du Gard. This is the view from the channel of the aqueduct looking back towards the regulation basin. The current pathway is in fact the bottom of the channel. Three arches spanning the Bornègre, on top of which the aqueduct was constructed. Interesting because of the arches, made up of blocks of interlocking stone that individually cover the complete width of the bridge. Standing in the pathway about 150m from the bridge, you might notice about a metre of formed stonework bisecting the path. Or you might not. You can see here a line running from bottom left to top right. This is made up of about 1 cm of concrete to the left of centre and 1 cm of calcium deposit to the right, backed to the left by large cut stone. There is another fragment like this running exactly 1.2 m to the right: the width of the aqueduct. It sits in the present day unmetalled path between St Maximin and Argilliers and runs in a line at about 90 degrees from the line of the bridge. An unexcavated portion of the aqueduct hiding in plain sight.- in anything but a straight line. The aqueduct followed the line required by the contours of the route to ensure constant downhill progress using only 14m of drop over its 50 km route. Sign up to follow this and other photographically inspired musings in the coming months. A monthly diary following Susan in her garden through the course of a year, with seasonal photo essays, ‘Details and diversions’, reflecting the natural cycle of the gardener’s year.